Two ingredient paleo pancakes, boy that title is quite a mouthful. 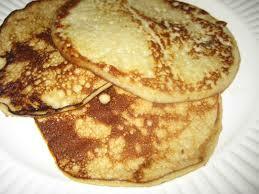 So is this delicious, easy and healthy recipe for pancakes. We just LOVE them! I came across this recipe when I was taking part of the Whole Life Challenge last year. This entry was posted in What we're eating and tagged Food, health food, paleo, two ingredients, whole foods.